096079 Heart with Circle on cord  - $20.00 : Red Bird Mission Crafts, Hand crafted art. 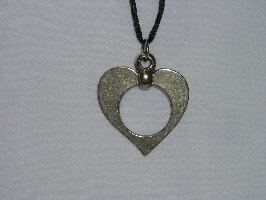 This approximate 1.25" x 1.25" Heart shaped medium medallion with a circle in the middle is handcrafted lead free pewter and on an approximately 36" satin cord. Have you ever wondered why the heart we all know as the Valentine heart doesn't look like a real heart? One theory says it recall the back and wings of a dove, associated with Aphrodite, the goddess of love. It could also be a shape created by the necks of two mating swans. It might show the two individual side which are united in a mystical center. Whatever the source, there is no doubt it means love and passion. Fun fact: The emoticon for heart is, sometimes expressed as "I less than three you!